Tópico em 'Seguimento Meteorológico' iniciado por guisilva5000 29 Mai 2016 às 14:15. Thomar, DaniFR, Topê e 3 outras pessoas gostaram disto. Época de estiagem deve começar oficialmente em Junho, com o calor a chegar em força. Depressão térmica volta associada ao AA, mas com a depressão a afetar os Açores a nortada não deve ser tão forte (pois o AA está basicamente estrangulado). Devemos ter breves ondulações "frescas" do Atlântico, mas nada demais. Possibilidade de alguma precipitação para o próximo fim de semana no Litoral Norte e Centro , segundo os modelos e a previsão oficial do IPMA. A sério??? Nem quero acreditar... para este fim de semana? Mas ainda se mantém essa previsão? Diria que, haverá algum potencial para a ocorrência de fenómenos localizadas de vento extremo, com maior probabilidade de ocorrência no grupo ocidental e central e menor probabilidade no grupo oriental, isto para o período da madrugada e manhã de segunda-feira. guisilva5000, TekClub e luismeteo3 gostaram disto. Amanhã vai torrar bem, o AROME mete 39ºC no vale do Sado e Guadiana. guisilva5000, TekClub, luismeteo3 e 4 outras pessoas gostaram disto. Sim, para a região mais a norte. A level 1 was issued for parts of N Spain and S France mainly for marginally large hail. 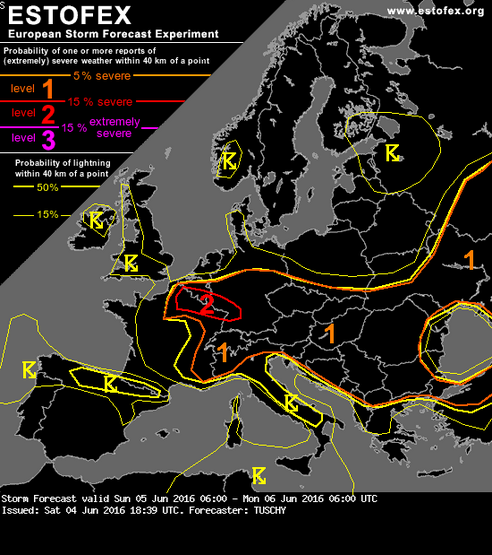 A level 1 was issued for SE Hungary, W Romania and N Serbia mainly for large hail and severe wind gusts. A level 1 was issued for Belarus and parts of the Baltic states mainly for excessive precipitation and to the lesser degree for large hail. 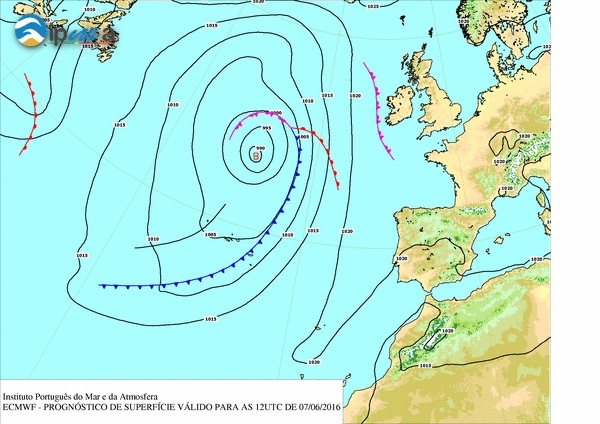 At mid to upper troposphere, a large cyclonic vortex centered over France and Great Britain will start amplifying southwards, with its trough crossing Spain during the forecast period. In response to the resultant strong WAA from Sahara northward, a ridge will amplify over the central Mediterranean. In between of these features, a strong southwesterly to westerly flow up to 40 m/s is simulated in a large belt from Spain through N Italy towards Balkans. 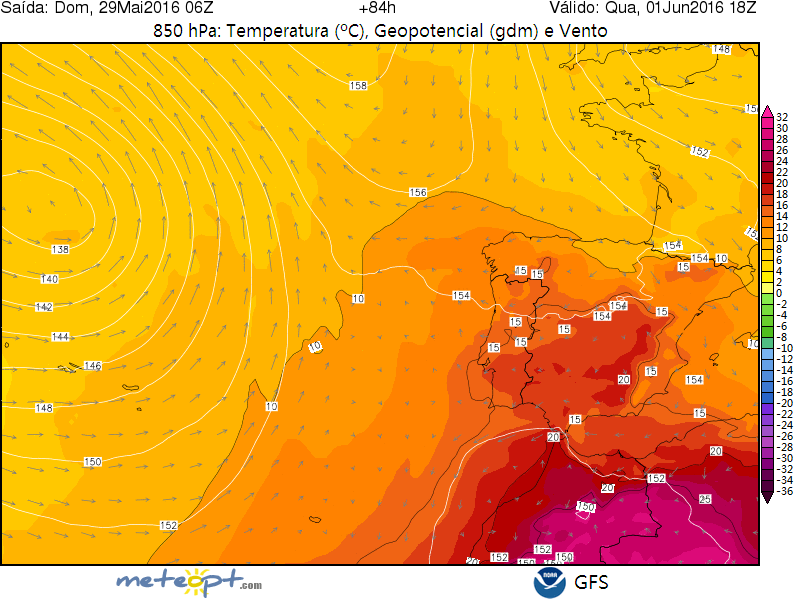 A plume of EML will be advected from Sahara towards central Italy during this period. 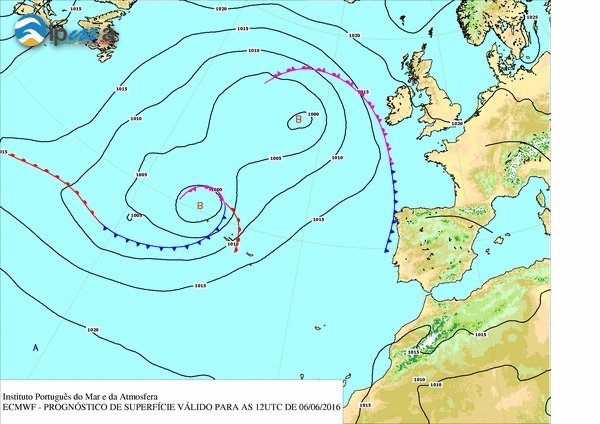 North of the ridge, a short-wave will cross parts of central and SE Europe towards N and NE. At the same time further to the east, a shallow trough will reside over much of E Europe, slowly retreating as ridge lifts towards Central Europe. 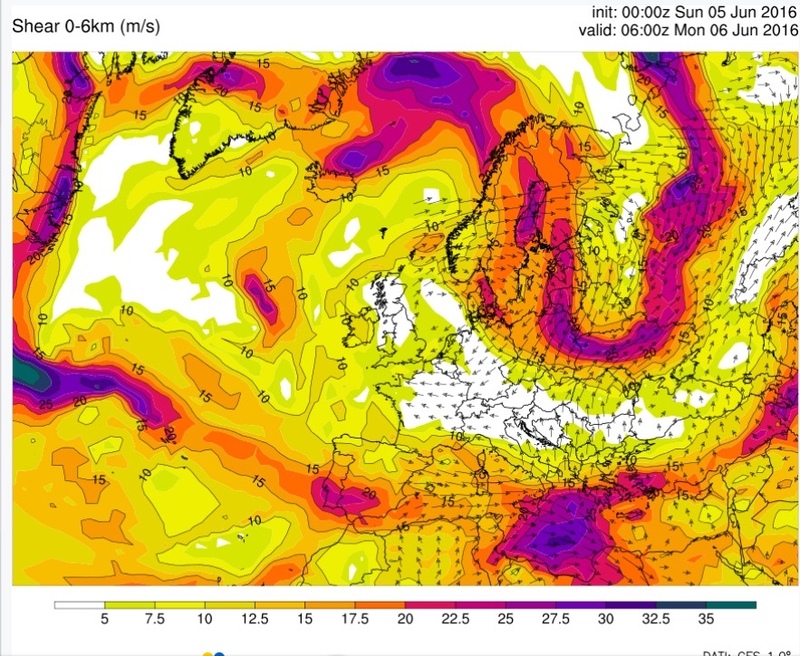 A large fraction of continental Europe will experience at least isolated thunderstorms during this day, with several areas requiring closer inspection with enhanced probabilities of severe weather. Approach of the trough will be associated with strong southwesterly mid-tropospheric flow and DLS values generally above 20 m/s. Models simulate relatively weak CAPE over Spain, where shear is stronger, while higher CAPE is simulated over S France, where weaker shear is simulated (15 - 20 m/s, increasing in the evening). The overall threat will not be very high, but a few severe storms capable of large hail will be possible in this scenario. Marginal to low-end CAPE (several hundreds J/kg) of MLCAPE is simulated by models as steep lapse rates are lacking over the region. On the other hand, DLS around 30 m/s is forecast with enhanced SRH values especially over NE Italy, where easterly component of surface winds contributes to curved hodograph. As the short-wave has already passed the region overnight, large-scale forcing will be lacking and initiation will depend on the position of the local convergence zones. Two most likely areas of initiation will be NE part of the area south of the Alpine range and the N Adriatics coastline. Storms will likely struggle in low CAPE - high shear situation. If they can persist, they may attain supercell form with threats of large hail and severe wind gust. A conditional Lvl 1 is issued for the area. IPV values suggest a short-wave will pass the region in 09 - 15 UTC time frame, followed immediately by the stregthening of the mid-tropospheric flow and an increase of DLS to 15 - 25 m/s. These values are conducive to well-organised convection, including supercells. Again, mostly low CAPE values are simulated by models, very unlikely exceeding 1000 J/kg. Another negative factor of the situation is that increase in DLS will happen behind the short-wave, in conjuction with amplifying ridge from the south. In the forecast soundings, one can find an evidence of mid-tropospheric subsidence spreading over the area from the south in the afternoon hours. Nevertheless, a window will exist for development of stronger storms capable of large hail and/or severe wind gusts. In the SE-ly flow on the flank of the shallow surface low, moist airmass will be advected over the region. Slow moving storms organised to multicells in 10 to 15 m/s of DLS will pose a threat of excessive rainfall. Stronger cells may also be capable of large hail, especially over the southern part of Lvl 1, where MLCAPE values may exceed 1000 J/kg. guisilva5000, luismeteo3 e DaniFR gostaram disto. A level 2 was issued for much of the Alps and the northern and southern Alpine forelands, as well as the Po Valley for all risks, i.e. for large hail, severe winds gusts, very heavy rainfall and also for tornadoes. A level 1 was issued for an area surrounding the level 2 area including much of the north European Plain, Czechia, Slovakia, the northwestern Pannonian plain, the Dinaric Alps and the Adriatic, the central Italian Peninsula. For these regions, the area was issued for the same risks as the level 2 area. A level 1 was also issued for north and central France, much of the Benelux countries and much of Germany. The main risk across these areas is localized heavy rainfall. A level 1 was issued across much of England and Wales for localized very heavy rainfall. An unseasonably strong southwest flow is present between an amplified longwave trough over Iberia and a ridge over the Balkans. A shortwave trough embedded within the flow is forecast to approach the Alps during the day. Large-scale upward motion should affect the level 2 area, which should lead to slightly steeping lapse rates, exceptionally strong deep-layer shear, and storm initiation in a number of regions. Strong surface cyclogenesis is expected to occur during the latter half of the period across SE Germany and later the Czech Republic and the German/Polish border region. Moderate low-level moisture is expected across the Po-Valley with surface dewpoints around 16-17 C. NWP guidance produces convective preciptation across the region before 12 UTC, especially along the Alpine slopes. The intense upslope flow is expected to produce very high precipitation amounts, most likely in the Swiss-Italian border region and further east across NE Italy and western Slovenia. Mixed-layer CAPE is rather modest with typical values in clear regions of around 1000 J/kg and almost not capped. The rather modest moisture and CAPE can be considered the primary limiting factor to the severe weather risk. Deep-layer (0-6 km bulk) shear is exceptionally strong, around 40 m/s. Variability among models in the low-hodographs is quite large, but areas of strong hodograph curvature are modelled in NWP models across northern Piemonte, Lumbardy, Veneto, Friuli, western Slovenia and western Croatia. In such areas 0-3 km helicity occasionally exceeds 400 m2/s2. As a result of the outstanding deep-layer shear, developing storms will likely rapidly turn into supercells with large hail and severe winds. A few strong tornadoes may also be expected. Any supercells that form may - sustained by the strong shear - survive the challenging topography of the higher mountains. Further southeast across Croatia, the risk decreases as CIN increases and storm coverage becomes questionable. Rainfall risk is an issue in Friuli and western Slovenia, and across the Italian-Swiss border region in northwest Italy, where the combination of persistent upslope flow and unstable air will likely lead to excessive rainfall with an important risk of flash floods. Rather high uncertainty exists in eastern Slovenia and southeast Austria where low-level humidity CAPE and CIN vary rather strongly from one NWP model to the next. Hence, convective initiation in the region is uncertain. If storms form, fair to excellent conditions for organized storms are present with strong deep-layer shear and considerable storm-relative helicity. Any storm in the area may become supercellular with all severe threats. Across southeast Germany, northerly upslope and convergent low-level flow is expected to develop near the developing surface low. Within this region, humidity should increase during the day. In combination with heating, CAPE of 1000 to 1500 J/kg are expected to form in a rather small area. Model consensus predicts convective precipitation during the late afternoon. Very high 35-40 m/s deep-layer shear and strong storm-relative helicity of 300-400 m/s suggest one or two supercells will develop. These should rapidly move eastnortheastward and bear a risk of severe wind gusts, large hail, heavy rain, and tornadoes. Additional cells may develop over the Czech Republic. The risk will shift northeastward during the evening, before reducing considerably overnight, as the convection becomes elevated. A few storms may develop in an environement of rather weak CAPE. However, given that deep-layer shear will increase strongly from the southwest during the afternoon, some storms may turn into supercells with a risk of large hail and a more limited risk of severe winds and heavy rain. Weak shear and weak flow, and rather low CAPE, but moist vertical profiles suggest that a risk of localized heavy rainfall will exist as diurnal convection develops. An isolated non-mesocyclonic tornado cannot be ruled out. Across this area, weak shear and flow and moderate CAPE of 1000-1500 J/kg are predicted. The moist vertical profiles suggest a risk of localized heavy rainfall as well in this area. guisilva5000, Mike26, luismeteo3 e 4 outras pessoas gostaram disto. A partir de amanhã regressam as condições propícias à ocorrência de tempo instável. A semana promete instabilidade convectiva, com aguaceiros e trovoadas, em especial nas regiões do interior norte e centro. 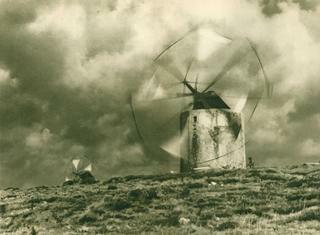 a tarde, com ocorrência de aguaceiros e trovoada. LRamos, dahon, CptRena e 2 outras pessoas gostaram disto. A forte insolação provocada pela elevada radiação solar contribui para um sobreaquecimento da camada inferior da troposfera em contacto com a superfície terrestre, o que desencadeia movimentos ascendentes de ar; estes contendo uma elevada percentagem de humidade, ao subirem e arrefecerem, contribuem para processos de condensação e formação de nebulosidade do tipo convectivo. Este processo será observado nas tardes de hoje e de amanhã, particularmente nas regiões do norte e centro de Portugal Continental, onde teremos aumentos temporários de nebulosidade e a possibilidade de ocorrência de aguaceiros e trovoadas. guisilva5000, rafathunderstorm, CptRena e 4 outras pessoas gostaram disto. Estou boquiaberto. O pessoal do Estofex não se enganou? A precipitação prevista para amanhã é quase residual. Estou curioso agora. guisilva5000, TekClub, CptRena e 2 outras pessoas gostaram disto.